SKY MAP: Toward the west at 10:30 p.m. on June 17 from mid-northern latitudes. Two bright planets are approaching each other in our evening sky. Mars, which was so brilliant last fall and has since diminished dramatically in brightness, and Saturn, which has adorned our evening sky since midwinter, are currently visible about one-quarter of the way up from the western horizon as darkness falls. You shouldn't confuse them with the nearby "Twin Stars," Pollux and Castor, in the constellation of Gemini. Mars and Saturn are located above and to the left of the Twins. Yellow-white Saturn, shining sedately at magnitude +0.4, will appear to the upper left of the much dimmer Mars, glowing with an orange-yellow hue. At magnitude +1.8, Mars now appears more than three and a half times fainter than Saturn. Despite the difference in brightness, the planets still should make for a rather eye-catching pair in the western twilight glow about an hour after sundown. Mars will appear above and to the left of Saturn; on the 16th it will appear directly to Saturn's right, while on the 18th, Mars will stand directly above Saturn. Saturn, at a mean distance of 886 million miles (1.4 billion kilometers) from the Sun, takes 29.46 years to move once around the Sun. Mars, at a mean distance of 141.6 million miles (227.9 million kilometers) from the Sun, requires only 1.88 years to complete that journey. As a result, Mars' normal eastward motion among the stars, as seen from Earth, is considerably faster than that of Saturn, and Mars will periodically seem to overtake Saturn in the sky. Interestingly, when we combine the motions of Earth, Mars and Saturn, we find that the interval between Mars-Saturn conjunctions averages about every 2 years and 20 days. The upcoming conjunction will be the closest one from 2000 through 2012 (although the one in July 2008 will be very nearly as close). In addition to Saturn and Mars, those using binoculars will also be able to see the famous Beehive Star Cluster in the same field of view. Mars, in fact, will appear to pass directly through the center of the cluster on the evening of June 15. Wait until the sky has become sufficiently dark (about two hours after sunset) to get your best view of the fainter stars of the cluster. 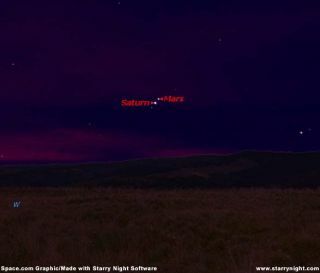 And as a final touch, if you look far down to the lower right of Mars and Saturn about 45 minutes after sunset, you may catch a glimpse of yet a third planet, Mercury, hovering low above the west-northwest horizon. It should appear as a yellowish "star" shining a bit brighter than Saturn. On the evening of June 9 make sure you don't confuse Mercury with the similarly bright stars Capella and Procyon which will be positioned far to its right and left, respectively. On June 11, Mercury will appear directly below Pollux and Castor, forming an isosceles triangle with those two stars.